Feeling so sorry for being late on my posting : these pictures were taken mid-september. Since then the quilt was achieved and delivered to my niece in Paris! Before showing it completed, I wanted to share with you the progress of it and the hand quilting. I hurried to finish it before leaving for Paris last month. The last stitch was sewn the night before flying, and the label sewn in Paris! 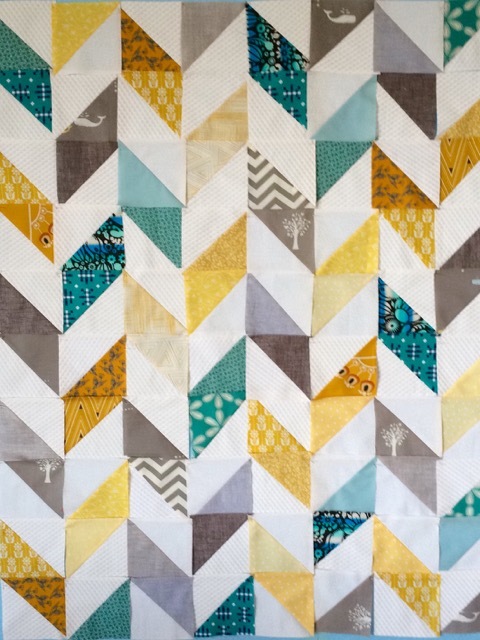 Next post will show this baby quilt finished and photographed in the future baby's room. A fun easy pattern that comes out soooo cute! Thanks for sharing your process. I always love seeing your lovely work. It's really beautiful, Christine, like all of your works. Love seeing the process photos. So it was really "down to the wire" for this quilt finish! 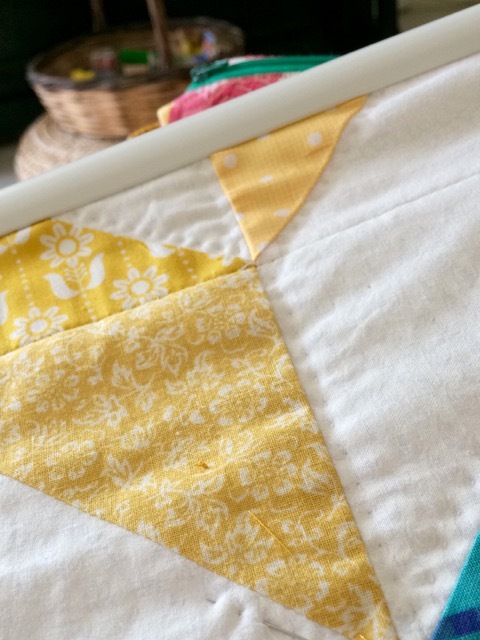 What a well travelled little baby quilt - super pattern. 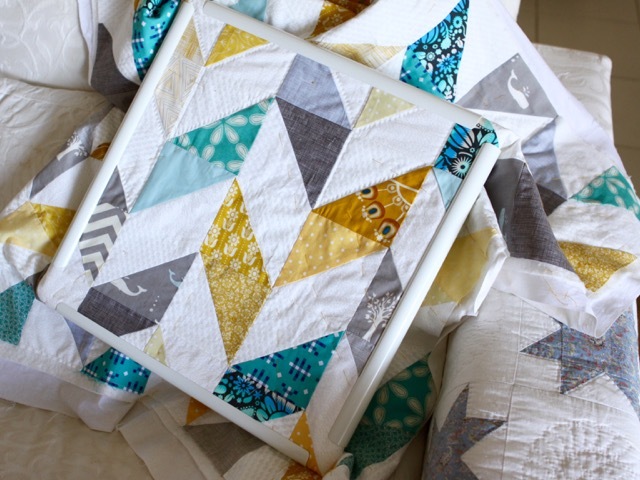 Sweet quilt, I love the colour combo! Très joli baby quilt Christine et j'adore les couleurs, très automnales ! 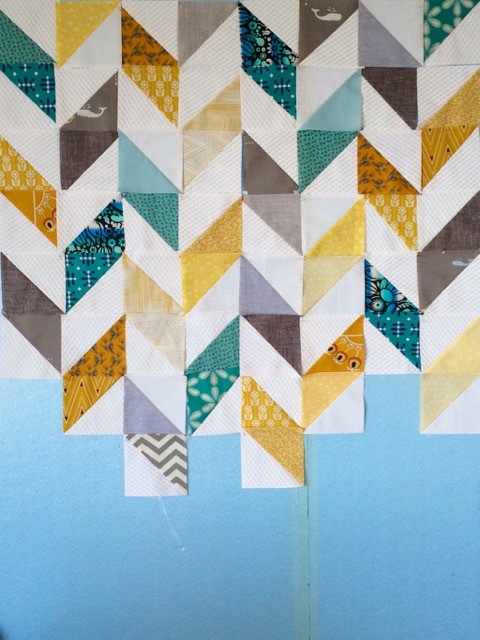 A lovely quilt, Christine, love the cool and calm colors. You always work with the prettiest fabrics. Hi Christine! I just love this quilt. My mother-in-law is going to make my husband and I a quilt similar to this pattern for our first baby due this Spring. Wondering, where did you get your fabric from? I love it. If you don't mind sharing. Thanks! Hi Katie! Thanks for your visit and kind words. 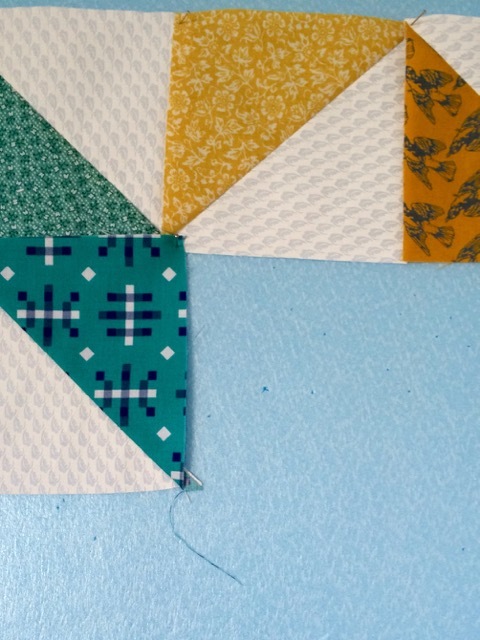 Unfortunately I don't remember the fabric brands I used for this quilt as they are all different from each others and some are just scraps from previous quilts.